The Edmonton Oilers have recalled OKC Barons defenceman Richard Petiot. Theo Peckham must have sustained an injury last night during his fight with Nathan Horton and therefore Petiot was recalled today. 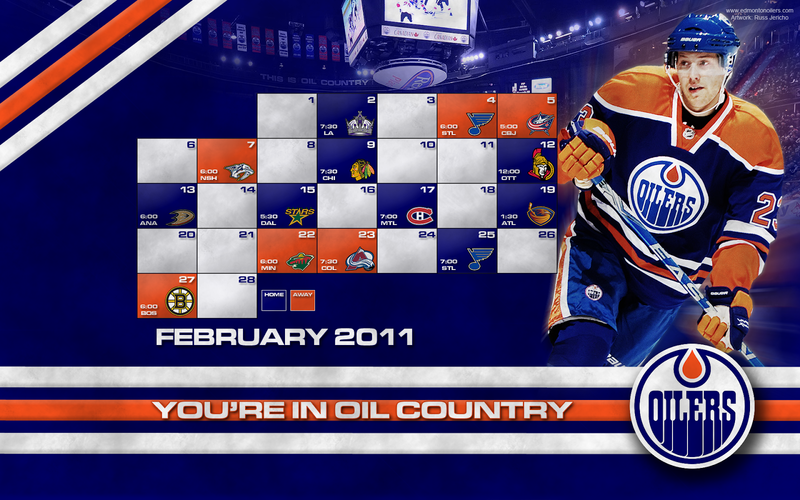 Petiot finally gets his chance to show the Oiler fans what he can do and I hope he doesn`t dissapoint. I`m waiting for the fans to ask why Teubert wasn`t given a game or two to appease the fan base instead of Petiot after the big trade. Two words.. not ready. 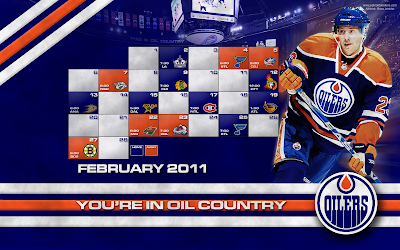 The NHL trade deadline came and went and the Oilers only did a couple of moves (for the small moves see the post below by Eric Rodgers). Penner for Teubert and the 2 picks was a great move by Steve Tambellini. He picked up a kid who`s not only friends with Eberle, but he`s young and fits into the future of this team. While I am sad Penner had to go, Teubert will be the real deal down the road. Tambellini is building a team that is not only young, but they will grow and develop together properly. Hmmmm.... where did we see this before? Oh right. The 80`s Oilers team. Not saying this team will match that, but I'm just saying. Have no fear fans, this team is moving forward the way it should be. I`m excited for the future. Are you? Two trades were made by the Oilers today. The first, an AHL only deal, sent defenseman Shawn Belle to the Lake Erie Monsters in exchange for defenseman Kevin Montgomery. Belle has been scratched since February 3rd, following Zack Stortini being sent down. 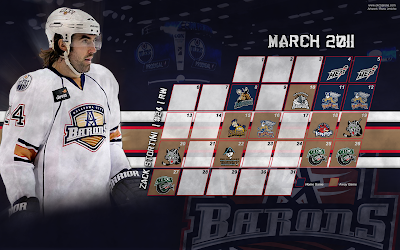 Stortini put the Barons over the AHL vet limit, and Belle had been playing through an injury. 22 year old Kevin Montgomery comes to OKC in his 2nd full season from the Monsters. The 6-2, 188 lb. defenseman played last year in 65 games, where he was a -18 with 1 goal and 6 assists. This season has been much kinder with 2 goals, 17 assists, and a -2. He was drafted #110 overall in 2006 by the Colorado Avalanche. He played his junior seasons for the London Knights and was on the 2007-2008 U20 Junior Championship team for the United States. The 2nd trade today involved the Barons getting a player, but he packaged from a deal that sent Dustin Penner to the Los Angeles Kings. Colten Teubert, drafted #13 overall in the 2008 draft, joins the Barons in his first full professional season. He played for the Regina Pats, which he captained in the 2009-2010 season. The 6-4, 195 lb. defenseman has 2 goals and 8 assists in 39 games with the Manchester Monarchs, skating with a +7. The 20 year old played for Team Canada in the 2008-09 and 2009-10 U20 Junior Championships, scoring 1 assist in 12 games between the 2 tournaments. With 9 defensemen currently on the Barons roster, I'm sure there'll be some demotions to Stockton. Right now, I have Johan Motin and Alex Plante on the bottom of my depth chart. Anthony Aiello is under a Professional Try-Out, but he has played very well in his time here. Clear Day has been set for Monday, March 7th at 3 PM Eastern. All 30 AHL teams must submit a 22 man roster, with those players being the only players eligible to play for the remainder of the season and playoffs. The only exception would be in the case of recall, injury, or suspension. Junior and college players may be signed to Amateur Try-Outs, but only after their respective club's season has ended. With the inclusion of Teubert and Montgomery, the Barons currently have 25 players on the roster. This week will be very interesting to see if Edmonton sends any of the rookies down for Clear Day, and who gets left off the roster. 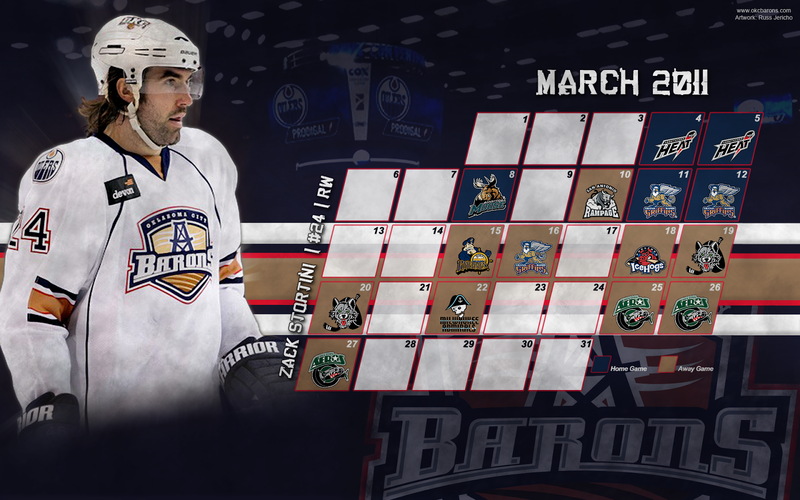 The Oklahoma City Barons had lost a shootout against Chicago after coming off a road trip where they had won 6 of 7 games, and they were sitting 4th in the division with only 2 points separating them from the division lead. 25 days and 8 games later, the Barons went 5-3-0-0 while the rest of the division has caught up in the Games Played column to help figure out just where the Barons stood. Two nights after the loss to Chicago, the Stars came into town. This was a crucial game as the Stars are one team I think it's going to come down to in the end as to who gets the 5th spot in the division and who misses out. After a scoreless 1st period, the Stars' Aaron Gagnon scored on the end of a Colin McDonald roughing penalty to put them up 1-0. Teemu Hartikainen answered 2 minutes later to tie the game off assists from Jake Taylor and Philippe Cornet. Unfortunately the tie would be shortlived as Colton Sceviour would put the Stars up 2-1, which would remain the final. The next night, the Wolves would be back for another game, the third meeting between the two in a week. Riding an Alexandre Giroux hat trick and his two helpers on goals by Brad Moran and Colin McDonald, the Barons would finally get a home win and beat the Wolves 5-2. Snow's a bit of a rarity in Oklahoma, even more so when it sticks around for more than a couple days. The week of a two game set against Peoria, one of what would be two snowstorms would hit the state. Luckily, the roads would be cleared enough for some people to make the Friday game. In what has been a custom between these two teams, the visiting Rivermen took that game, winning 4-1. Brad Moran would have the lone goal in that game. The next night, the 2nd game of the set, the Barons would finally break the visiting team streak, and win in the shootout. Peoria's T.J. Hensick would score at the 8:41 mark of the 1st on a Jake Taylor elbowing penalty. The Barons would answer in the 2nd, off an Alexandre Giroux PP goal at the 2:21 mark with assists from Bryan Helmer and Brad Moran. It would stay that way for the remainder of regulation and overtime, and the teams would head to a marathon shootout. After 9 rounds of stops by both Martin Gerber and Jake Allen, Gerber would make one more stop on Mark Cundari. Chris VandeVelde would step on to the ice next and would get it past Allen to give the Barons the first home win of the series by either team. Zack Stortini would make his first Barons appearance this game. The next night would take them to Austin, Texas to take on the Stars once again, where they would be shutout for the second time this season, losing 3-0 with Richard Bachman in net for the Stars. To add to the Oklahoma snow woes, after a week of below freezing temps kept the snow from the last week on the ground, another snow system comes in the night before the scheduled Kid's Day game against San Antonio. 6-12" may not sound bad to those in Edmonton, but when Oklahoma City only has about 1 plow equipped vehicle for every 40+ square miles in the city, it's not great. Luckily, what fell was a bit lower than what was projected, but the schools in the city had already announced they were going to be closed, and the team had already announced they were going to play the game as planned. I luckily only had a bit of a problem getting through one area, but I was able to traverse the mostly snow covered roads and make it to the game. After a very informal team introduction, and a recording of the national anthem, the game was played in front of about 200 fans. The Barons played what was probably their best game against San Antonio this season. Alexandre Giroux opened up the scoring at 10:10 of the 1st with assists from Colin McDonald and relative newcomer Anthony Aiello. Chris VandeVelde would cap off the 2-0 win with a goal at 13:25 of the 2nd with assists from Greg Stewart and Zack Stortini. The Barons were then generous enough to let the crowd onto the ice with the team to take a photo. After the "Barons Blizzard" game, the team had a 9 day rest period before they headed to Canada to take on the Abbotsford Heat for a two game set. This was a bit of a nail-biting time, as the rest of the division got a chance to catch up in the GP column. Luckily, the North Division won when it needed to against the West Division foes, and the Barons ended up only being 1-2 points behind a playoff spot. As they headed to Calgary for game 1 as part of the Heritage Classic, the Barons were hoping to come out with at least 2 points. The Heat's goalie, Leland Irving, was coming off a 4 game win streak, which included two shutouts. Game 1 started out with both teams going back and forth until a giveaway in the defensive zone to Ryan Stone put the Barons down 1-0 after 20 minutes. At the 7:18 mark of the 2nd, Mark Arcobello would answer with his first career AHL goal with assists from Ryan O'Marra and Richard Petiot. It would stay tied at 1 until the 18:54 mark of the 3rd, when Alexandre Giroux would give the Barons the lead from assists by Brad Moran and Colin McDonald. Chris VandeVelde would put the game away with an empty netter 48 seconds later. Game 2 would take the teams to Abbotsford, hometown of center Brad Moran. The Heat would take a quick 2-0 lead 12:49 into the 1st after goals by Greg Nemisz and Logan MacMillan. Brad Moran would cut into that lead 5:14 later from assists by Colin McDonald and the recently sent down Jeff Petry to send the teams to the locker rooms with the Heat leading 2-1 after 1. The 2nd period would go scoreless and Teemu Hartikainen came out swinging in the 3rd, tying up the game just 1:34 into the 3rd on a Power Play with assists from Alex Plante and Jeff Deslauriers. Tied at 2, the teams headed to OT, where Mark Arcobello scored his 2nd goal in as many games by backhand shoveling the puck past Leland Irving from a Hartikainen pass, giving the Barons 4 points on the weekend. The Barons are back home this week for 3 games of their 4 in 5. The Barons take on the division leading Admirals on Wednesday, the Rampage on Friday, the Aeros on Saturday, and then head to Austin for another matchup against the Stars. This will be a very crucial weekend for the team, as all 4 teams are ahead in standings by 1-4 points. 18 of the last 24 games for the Barons are against division teams. Clear Day should be coming up in the next couple weeks. Last year's deadline for the rosters was March 10th, one month before the season ended on April 11th. This season will end on April 10th, so it would be my guess that it will be very near to the same date this year. For those who are unaware, Clear Day is the day all the teams have to submit a 22 man roster. Only those players listed on a team’s Clear Day roster are eligible to compete in the remainder of the AHL regular season and in the playoffs, unless something happens such as a recall, injury or suspension. Amateur players, such as junior players or college players, are eligible to sign tryout contracts within that time however, once their team's season is over. Tough roads ahead for the Barons. The playoffs are really going to come down to the wire, and it won't get any easier with the majority of the remaining games against division teams. Stretch run, here we come. Adding to the Oilers/Sheldon Souray debacle, the Oilers put Souray on re-entry waivers Friday in hopes that a team would pick up his contract at half price. Then comes Noon Monday(EST) and Souray gets passed on once again, the first time having been when he was originally loaned to the Hershey Bears. It seems like the scouting reports from the NY Rangers may have soured a few teams on him in my opinion. When you're reported as having trouble even keeping up in the AHL, I can't imagine anyone would pick want to pick you up at that kind of price tag. I just wonder if this will set up a buyout for next season, or if the Oilers will hang on to him for the last year of his contract to play in the AHL again. Oklahoma City Barons vs Peoria Rivermen.